Raffaello Sanzio (1483 - 1520), master of Urbino, is one of the most well-known and loved Italian artists in the world. Native of Urbino, his works are in several Italian cities, including Rome and Florence. Also many international museums boast the possession of some paintings by the master. In the Uffizi Gallery, also in the New Uffizi, there is the Raffaello room. Here some very important works are preserved, including the Madonna of the Goldfinch and a self-portrait. There are also some important portraits. Raphael\'s works are also exhibited in other Florence museums, like the Palatine Gallery in the Pitti Palace. Why so many works of the master are in the city? Raphael lived for a period of four years in Florence, from 1504 to 1508. He arrived in the town because he was curious to observe the works of Leonardo and Michelangelo, who in that period challenged in Palazzo Vecchio, engaged in the Battle of Cascina and the Battle of Anghiari, two never completed frescoes. 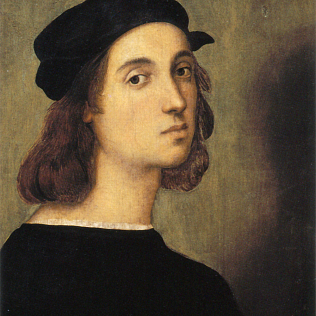 In Florence, Raphael studied the art of Leonardo and Michelangelo, that had a significant influence on his work. In the Madonna of the Goldfinch, for example, it is easy to see Leonardo\'s elements, but interpreted and edited according to the Raphael\'s style. He studied in depth even the big artists of the Quattrocento, as Masaccio and Donatello. Besides the famous portraits, now preserved in the museums of Florence, Raphael also made paintings with a religious theme, such as Madonnas and Holy Families. The series of the Madonna and Child in Florence reaches very high levels: in this period, in addition to the Madonna of the Goldfinch, he also painted the Madonna del Belvedere, the Bridgewater Madonna and others. Even in portraiture, Raphael stands out for its style and the important innovations in the representation of the expressions and in the composition of the works. The Florentine years were therefore very important for the great artist from Urbino. In Florence he had the possibility to know many contemporary artists and to study the greats of the previous century. The town atmosphere contributed to the definition of the unique style of Raphael, and even today we are fortunate to admire a significant part of his production at the Uffizi Gallery.